Michele Gamba studied composition at the Milan Conservatory and philosophy at Milan University. After winning the Rudolf Serkin Prize, he went on to study at the Royal Academy of Music in London, where he specialized in chamber music and Lieder. He also studied chamber music with Maria Tipo at the reknowned Scuola di Fiesole, Lied and conducting in Vienna and at the Accademie Chigiana in Siena. Initially pursuing a promising career as a solo pianist, he gave his conducting debut in 2009 at the Royal Festival Hall with the ‚Future Firsts‘ of the London Philharmonic Orchestra and was then invited to work as assistant conductor and répétiteur at the Hamburgische Staatsoper. Between 2012 and 2015, Michele Gamba was a member of the prestigious Jette Parker Young Artists Programme at the Royal Opera House, Covent Garden, as conductor, which lead, at the invitation of Sir Antonio Pappano, to the appointment as his Assistant and Jette Parker Associate Conductor. With Antonio Pappano, he has worked closely on a variety of operatic productions and in symphonic repertoire with orchestras like the ROH Orchestra, the London Symphony, the Royal Philharmonic and the London Philharmonic. 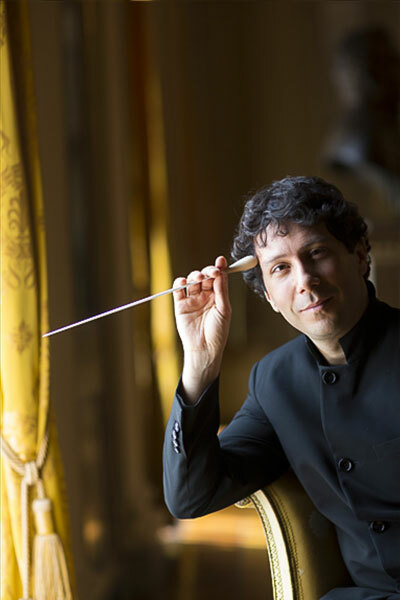 Whilst at the ROH, he also conducted Bastien und Bastienne, Berio’s Folk Songs, and excerpts from Eugene Onegin, Così fan tutte and Les Pecheurs de Perles. In autumn 2015, he gave an acclaimed house debut at the Staatsoper Berlin in Le nozze di Figaro in a new production by Jürgen Flimm and assisted Daniel Barenboim in La Traviata, Simon Boccanegra and Il Trovatore the same season. This was followed by a spectacular last-minute debut at Teatro alla Scala in I due Foscari, jumping in at only half an hour’s notice. He was immediately reinvited for an Accademia production of Mozart’s Die Entführung aus dem Serail and for Le Nozze di Figaro, both in the 2016/17 season. Other opera engagements include Norma at the Macerata Festival in Italy, a return to the Hamburgische Staatsoper for a revival of Stefan Herheim’s production of Le Nozze di Figaro, house debuts at Opera de Montpellier in Rossini’s Armide as well as at Teatro dell’Opera di Roma in Rigoletto. Active both in the symphonic and operatic repertoire, Michele Gamba has conducted orchestras such as the Southbank Sinfonia London, Welsh National Opera, Divertimento Ensemble, the Sofia Festival Orchestra, I Pomeriggi Musicali, Orchestra Sinfonia Siciliana Palermo, Orchestra del Maggio Musicale in Florence and the Orchestra Sinfonia Nazionale della RAI. Highlights in 2017/18 include house debuts at Venice’s La Fenice in Rossini’s L’occasione fa il ladro, at Stuttgart Opera in La Sonnambula and the Teatro Nacional São Carlos in Lisbon in La Traviata, a return to the opera house in Montpellier for a symphonic programme as well as debut concerts with the Duisburger Philharmoniker and the Tokyo Symphony Orchestra.